The word graffiti is actually the plural of the Italian grafio, which means a scratch or scribble. While the crude wall “scribblings” found in the ancient volcano-buried city of Pompeii may have inspired the term, it’s actually grown into a surprisingly intricate art form today. Graffiti inspires and surprises, bringing color to grey cityscapes, as well as drawing on iconic images to drive home a social message or political point. 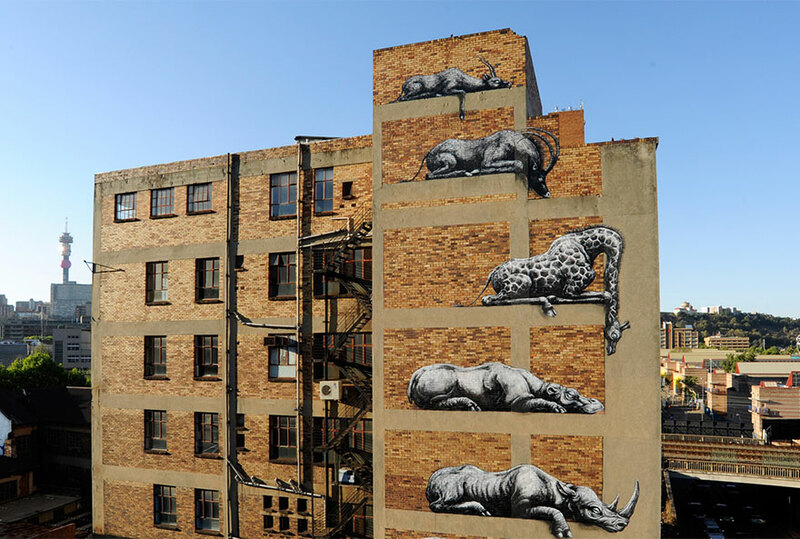 We’ve scoured the world for some jaw-dropping works of street art, many of which were done in secret due to their controversial content. Number 6 doesn’t even seem real! UK-based street artist Banksy uses a silhouette-like style that’s familiar to any graffiti fan, and his works are a mix of social commentary, naturally-occurring shapes, and poignant anti-establishment images. This piece, is a throwback to similar gestures made by Vietnam War-protesting hippies in the 1960s. Banksy features a young middle eastern boy sliding a colorful daisy into the gun barrel of a heavily-armed soldier in a silent protest for peace. …admirers of this brilliantly-colored cityscape by artist Dank out of London. Splashed across a dusty relic of a warehouse, this piece provides a startlingly realistic glimpse into the neon-drenched, car-packed streets of a busy metro area after a rainstorm. It’s like a portal to another world shown in real scale, and it definitely injects the surrounding area with a feeling of vertigo. …check out this crazy toucan from Die77 in Bolivia. He uses the existing structural lines of the adjacent parking garage and artificially lengthens them to provide the impressive 3D effect surrounding this giant tropical bird. While it’s a colorful reminder of the actual tropical wildlife one might see in the country’s rainforests, it’s also a stark reminder that deforestation in the region is threatening their very existence. This image, dubbed Naturalize, features a work of art by Italian artist Luispak’s, trying its best to blend in with the world around it. This statement that could be applied just as easily to current worldwide immigration and refugee woes as environmental ones. Called “Love is Love,” London-based artist Stik uses a childlike style to demonstrate a point that should honestly be taught to all children, worldwide. A Muslim woman, wearing a hijab, is clasping hands with a white individual on a red background. The image was placed in a community where racial tensions are traditionally high, likely in hopes of reminding residents of their shared humanity. 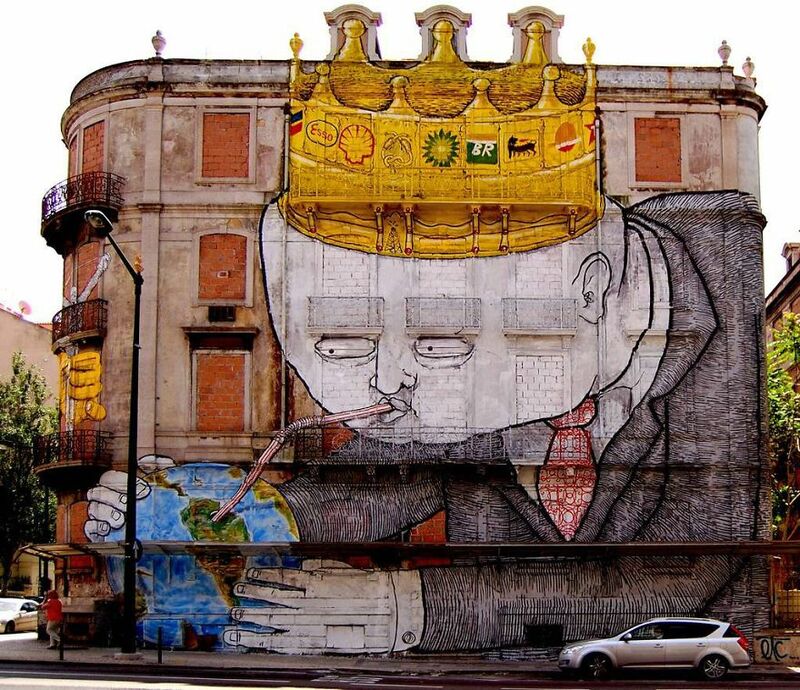 A crowned, suited white man takes a drinking straw to the globe’s resources on the side of what looks to be a condemned, bricked-up building on an inner city street corner. The twist? His crown is adorned with the corporate logos of companies widely considered to be contributing to the pollution and death of the planet. A very obvious commentary on our less-than-intelligent use of global resources, this stylized, naked man figure is seen yanking up the few remaining trees in the image and thrusting them towards his face like broccoli, while a pile of nearly-identical unused houses accumulate out of the “other end.” While some might resign themselves to this cycle, our next slide encourages people to take back green spaces in a very clever way. As more and more natural areas and recreational spaces are demolished to make room for progress – typically in the form of shopping centers or condos – nostalgia occasionally gives way to action, as seen in this tongue-in-cheek visual protest grafitti. 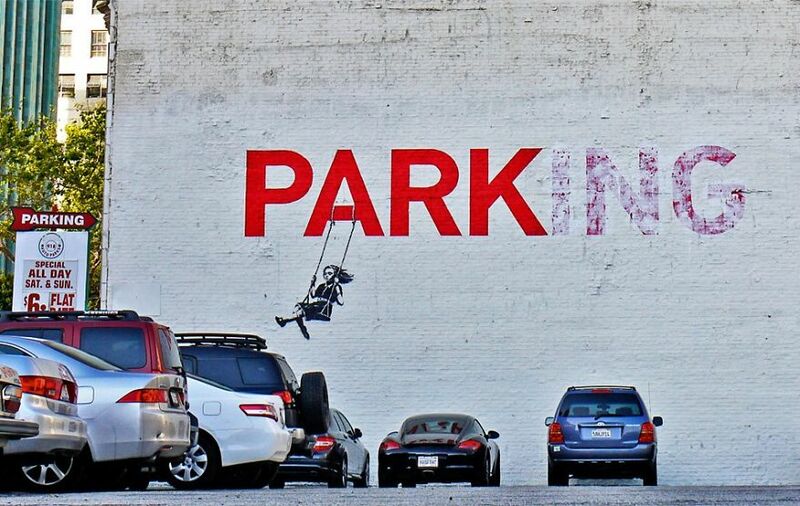 The i-n-g of parking has been mostly painted over, leaving room for a young girl to swing from the A in park. Recreation itself can actually make a statement. This is Five Pointz, a formerly famous impromptu showcase of graffiti artists’ skills in Queens, in New York City. Once a towering testament to the beauty and artistry found in simple cans of spray paint, the entire building was demolished to make way for a condominium parking lot in 2015. Images like this show us why often-illegal graffiti art is typically temporary, and highlight why photos – particularly of controversial pieces – are so important to its preservation. …world hunger. This building-side image first appeared as a protest piece when the 2014 World Cup Soccer matches were being held in Spain. In the wake of accusations of tone-deaf multi-million dollar Olympic investments in the heart of the slums in Rio, Brazil, this is a lesson that’s more important than ever. This striking artwork was eventually purposefully destroyed, but unfortunately child hunger isn’t an issue that can simply be painted over. 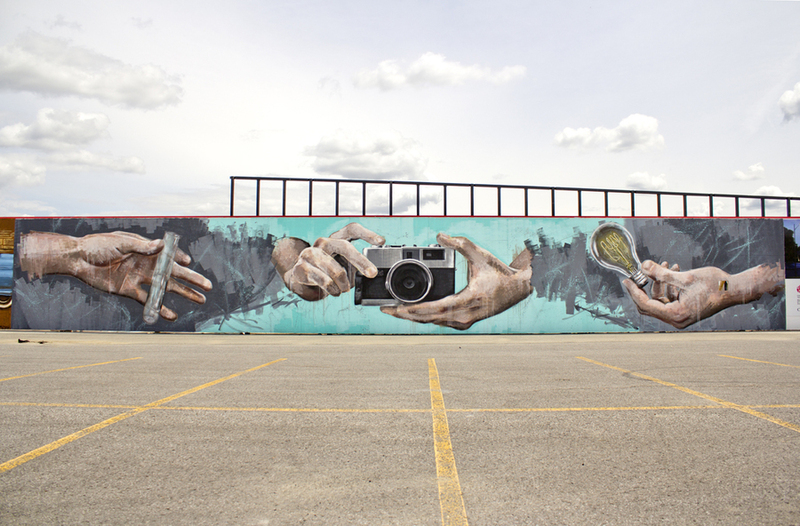 Ottawa artist Ryan Smeeton’s work is less spray paint-at-midnight and more commissioned mural, but he uses graffiti-like styling to inspire and illuminate young minds at the Canada Science and Technology Museum. This trio of hands holds tools that urge curious kids towards artistic and STEM field pursuits, such as chemistry, electrical engineering and photography. 16. 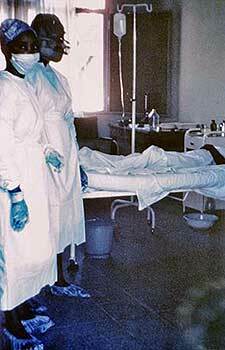 Will You Validate Me? Located in Spain, street artist Dan Ferrer flipped the script on the iconic set of “See no evil, hear no evil, speak no evil” monkeys for this activism-spurring piece of art. In it, three tableaus of the same man encourage viewers to see, listen and reply through exaggerated gestures opposing the censorship of the original primate trio. It’s a prime example of how classic, familiar images can be used to inspire interest and action through street art and a clever message. 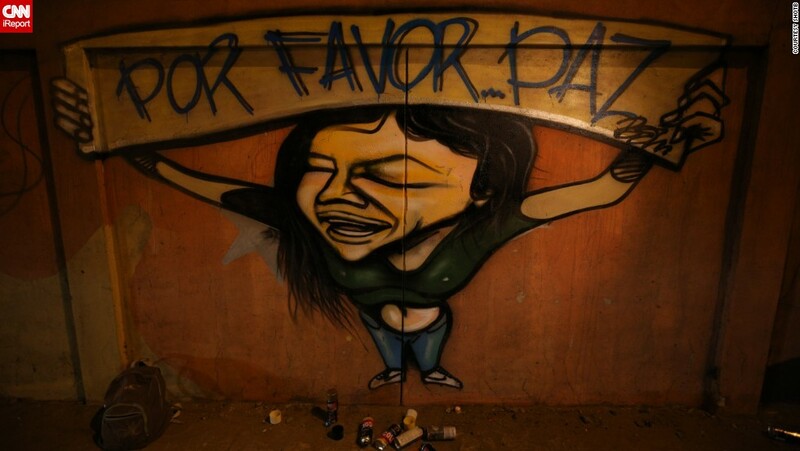 This simple, poignant piece from Mozambique features a woman that holds a banner up with a Spanish message that translates to “Please, Peace.” It’s an important reminder to keep peace within ourselves and to encourage it in the world around us, too! 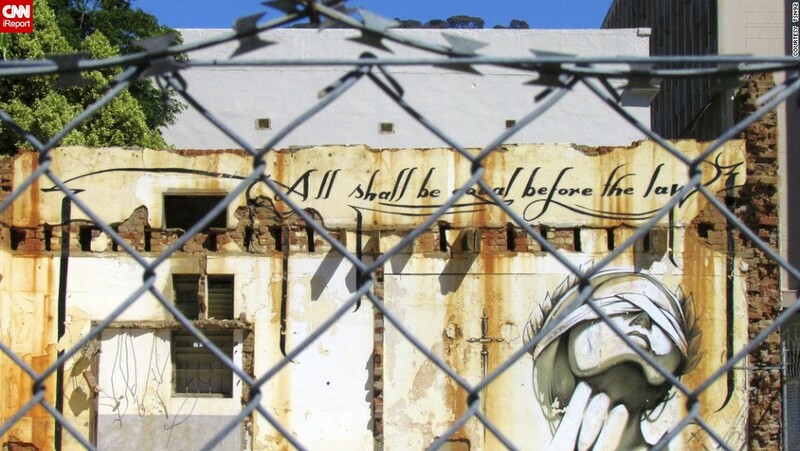 This unusual but highly intricate graffiti mural in Capetown, South Africa features a gorgeous sketch of the blindfolded female visage of justice, underneath a calligraphy-like message that states that “All shall be equal before the law.” This is an important message in the often politically-charged region, where residents may be tempted to take the law into their own hands. Another Capetown addition to this beautiful graffiti list, this piece is called “Inspire ourselves to inspire each other.” It encourages residents of South Africa to trust and turn to one another for guidance and inspiration, and supports peer leadership for all ages. 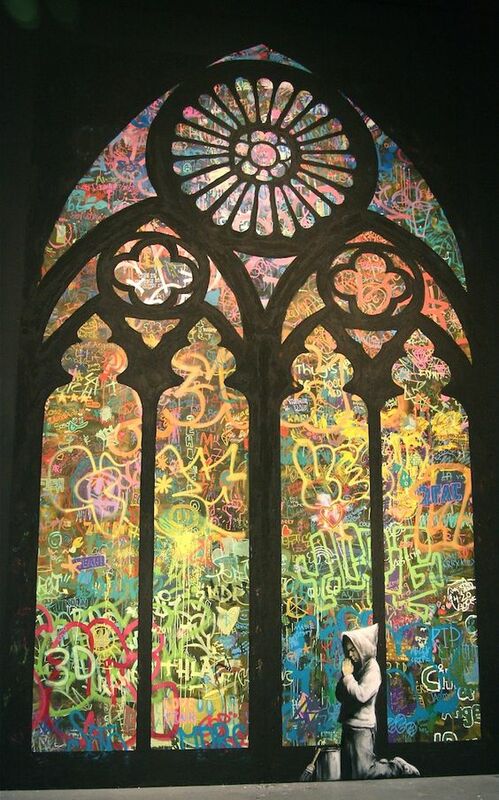 Art and faith have always been intertwined, and Banksy does a fabulous job of capturing that often-complicated relationship in a single breathtaking image. Modern but somehow timeless, this silhouette is bound to linger in the memory of anyone that passes by. That blending of modern themes and street art makes for some truly interesting pieces. 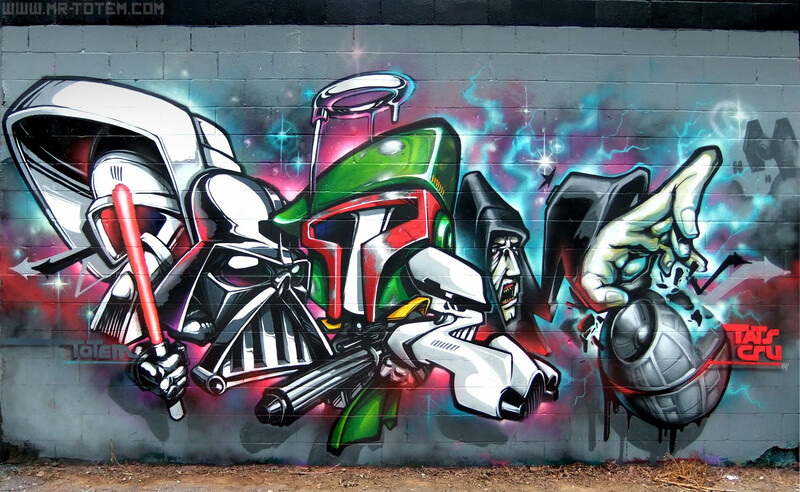 This interesting work blends the artist’s “tag” or signature – this one was created by NYC-based Tats Cru – a modern theme that echoes the newest Star Wars franchise film. The familiar colors draw the eye of fans, but they discover that it’s so much more than it seems at a glance. Great graffiti builds on the familiar and encourages viewers to feel, discuss and explore. Take this graffiti, for example – it uses the usually-austere presidential faces of Mount Rushmore and swirls them into a crazy kaleidoscope of color, utterly changing the way they look. Color is an important characteristic to a great piece of graffiti, but sometimes black and white can be even more visually intriguing. Keith Haring was arguably one of the most well-known graffiti artists of the 1990s, drawing much-needed attention to crucial subjects like AIDS, HIV and drug abuse. This mural, Crack is Whack, has been used in anti-drug campaigns from the time of its creation, even well after Haring’s death. Sometimes realism is needed to capture the eye properly. It’s incredible to think that this Glasgow graffiti mural is not a photo, but paint. 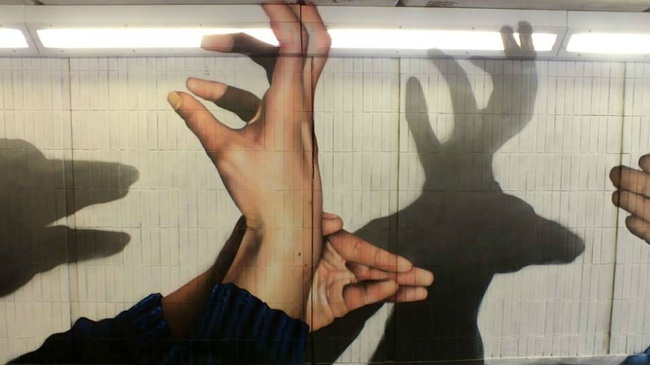 The artist’s ability to capture realism is astounding, and the playful subject matter is one a series of shadow hand puppets adorning a subway wall to delight commuters. The best graffiti murals are sometimes hiding in plain sight, just like this next one. 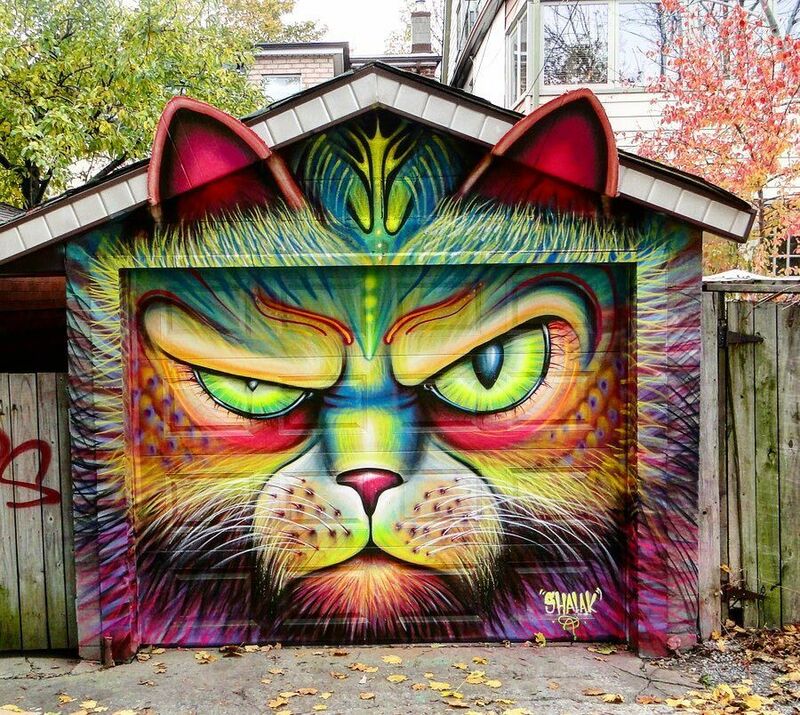 The neon highlights and airbrush-like quality take this garage-dwelling grumpy cat to the next level. It’s gorgeous by day, but just imagine lighting it up with a blacklight after sunset. Talk about an amazing Halloween decoration in the making! 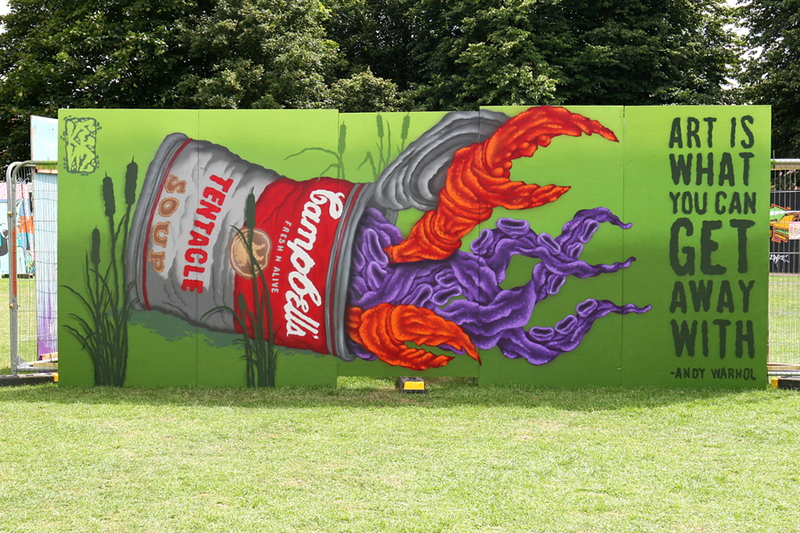 This fun twist from the UK’s Carl Kenz features a series of brightly-colored tentacles tumbling out of a Campbell’s can, ala the old snake prank. Also included is a smart tip for aspiring graffiti artists across the globe, in the form of a Warhol quote: Art is what you can get away with. That means, of course, that art doesn’t always have to be up on a wall. 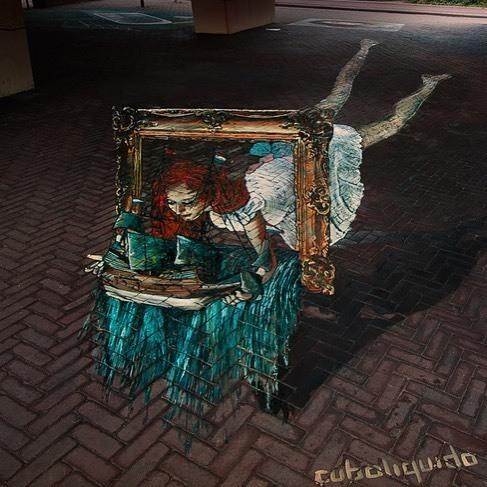 Sometimes graffiti is right under your feet, like this interesting brickwork, forced-perspective piece from Cuboliquido in the Netherlands. A young woman reaches into an antique frame to fetch a boat, splashing “water” everywhere around her. This interesting poolside piece in Italy uses an art technique that makes it look like it was pulled straight out of an old video game. 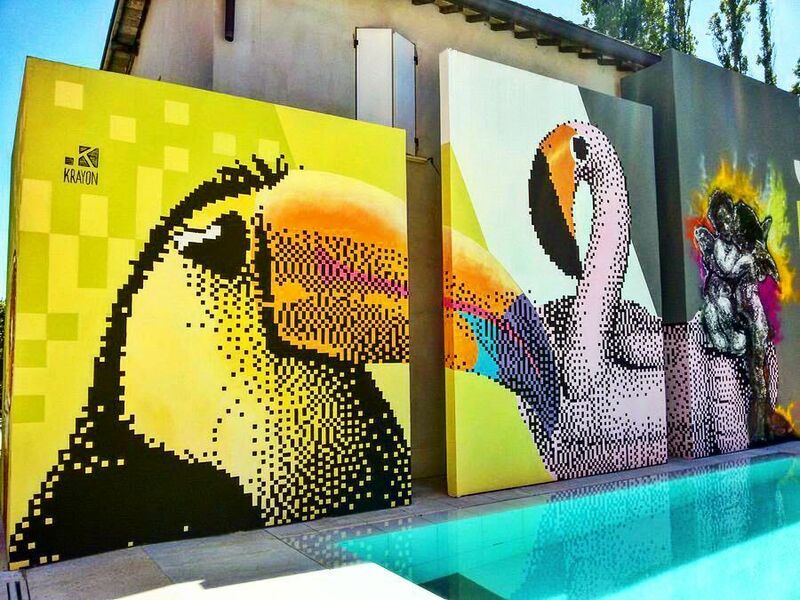 The birds are both beautiful and interesting, making this a piece that the lucky pool-goers can appreciate as they relax. This next bird is a little more energetic. Of course, graffiti can always hit the road too, as this gorgeously spray-painted ride demonstrates.